Naturally, the cats were horrified that I dismantled their hay castle. I would grab a hay bale, try to shift it, and discover it wasn’t moving because five sets of forepaws had grabbed it through the mesh of their haystack walkway and were hanging on grimly. 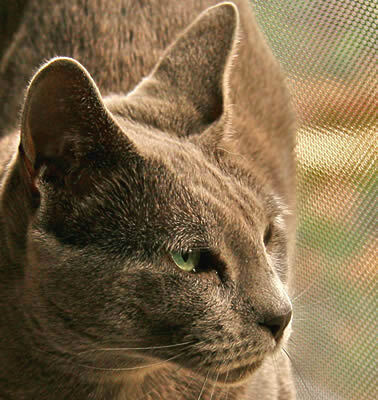 They complained bitterly, and Janey, on advice from her lawyer (Russian Blues are always the first to lawyer up), has registered a complaint with the humane society. There were others dismayed by the gradual dismantling of the hay stack. A family of rats had taken up residence in its very heart (no wonder the cats spent hours in there communing), and, as I shifted the hay, they took refuge in the ever dwindling pile until there was only one bale left … and then nowhere to hide. But today has brought happy news for both rats and cats. More hay has arrived! (Well, actually, pea straw, to be totally specific.) The hay castle is back in place, and Janey was thrilled that a handsome man helped out in the building (Gary from the landscape suppliers). Gary also bought a mountainous pile of compost/soil. I still have half of the new raised veggie beds to fill, plus all of the pots I will use. Soooooo – lots more work ahead. I had to rush out and get in several large tarps to cover the pile as rain began to fall. It was mucky work scrambling over the pile in my wellies trying to fix the tarps while the rain poured down. Naturally it stopped raining as soon as the tarps were in place. Janey is out in ‘her’ walkway in the centre of ‘her’ new hay castle, cooing to the family of rats currently sheltering under the house that the hay is back, and they can come nest again. Most of my gardening gear lives under my car port. I don’t have a car, so a couple of years ago I had the carport ‘walled’ in with lattice work, one side shelved out with deep shelves, and now it is kind of a huge garden shed. It is kind of scary how quickly I have filled it up. Granted, the hay takes up a fair bit of room, but oh the junk! LOL When I lived in Bendigo I didn’t have any kind of shed or car port at all – I have no idea how I managed! I had no stuff!